You are browsing the archive for February 2015. The Hub Radio Station are kindly organising this fab event for us. 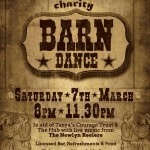 This amazing event is being held at Probus Village Hall on 7th March from 8pm. 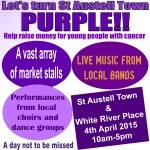 We are very excited to be holding our annual Purple Day event this April (4th) in St Austell Town and White River Place. Our aim is to get the whole town of St Austell involved, we would like to make this a really big event, not only for our charity but also for the town centre.